Yesterday I visited the Institute of Mosaic Arts which was everything I wanted it to be: fun, inspiring, friendly. It's located in a wonderful arty, industrial neighborhood and after filling myself up with mosaic, I walked around the area taking pictures of rusty pipes, old car parts and colorful stuff in dumpsters. It was glorious. 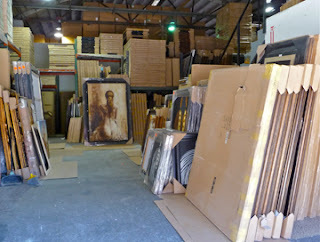 Then I happened across an open warehouse door and when I looked in, it was stacked floor to ceiling with art. Huge pieces of art framed in faux leather and gilt, representing many genres ... colorful impressionist landscapes, nudes, abstracts, florals. Pallets of plastic-wrapped frames waited on the sidewalks. The past few years have been a challenging time for artists, but here were stacks of paintings waiting to be delivered. It boggled my mind so I wandered into the warehouse trying to find someone to talk to but it was quiet, no one but me and hundreds, maybe thousands of frames, framed canvases and those waiting to be framed. I youhooed and finally a woman appeared, cell-phone in hand. She was friendly, apparently middle eastern from her accent, and, when I asked, she said they sold to businesses, hotels and interior designers. Her phone rang again before I could ask more so I wandered around for a few more minutes and noticed the "Made in China" signs on most of the boxes. After I left, that warehouse haunted me as I thought of the thousands of artists toiling away in their studios, unsold canvases stacking up, while this warehouse delivers cheap art into the waiting arms of hotels and businesses who want the impression of art on their walls. Then I also thought of the thousands of people in China working most likely in sweat-shop conditions making "art" on an assembly line. The topic of "what is art?" is a popular one and this experience made me wonder about it once again. The company name on this warehouse was Garber Corp with a tagline of "Fine Art & Accessories," apparently claiming the designation of "art" for their product. It also made me wonder about our values. It's easy to be irritated at the businesses across the country that are buying cheap art instead of supporting their local artists. But that made me remember a walk through WalMart where I saw an aisle rack of sparkly $5 shoes. Do we really need fake art and throw-away shoes? What happens to us when we fill our lives with cheap knock-offs?